Dave Arbogast is an exclusive SCA Performance (also known as Southern Comfort Automotive) dealer. We offer an extensive inventory of lifted trucks and lifted jeeps from SCA Performance. We are located just minutes north of Dayton, Ohio, just off Interstate 75 at Exit 69. We will buy your pre-owned Jeep! If you are wanting to sell or trade your jeep, please contact us. Our professionals appraise lifted jeeps daily, and are ready to make a competitive offer. We will buy your Jeep even if you do not purchase a vehicle from us. We offer nationwide delivery of custom jeeps right to your driveway. Shop from the comfort of your home, and let our professionals take care of the rest! Obtaining financing for lifted jeeps is easy. Just click here to apply for financing and one of our finance professionals will be of your assistance. All jeeps are not alike, as the talent at SCA Performance demonstrates. There are three spectacular custom Jeep Wranglers in the JK-M series that will win the hearts of off-road enthusiasts. Jeeps by SCA Performance utilize the finest components in the industry. These custom jeeps feature Rigid Industries Off Road Lighting, BF Goodrich Tires and more! SCA Performance is a leading upfitter of Lifted Trucks and Jeeps in the nation. They include the JK-M1, JK-Z1, and JK-Z2 standard packages and upgrades with available optional equipment. The results are stunning with imposing 35 inch All-Terrain tires from BF Goodrich included in all three versions. Color coordinated bumpers, fenders, and accents throughout the chassis add a stylish flair on the JK-Z1 and JK-Z2 packages. The JK-M features a 3 inch suspension lift with 35 inch tires mounted on 18 inch custom wheels. 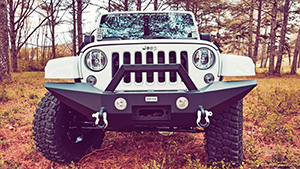 JK-M lifted custom jeeps feature rugged bumpers and rock rails with adjustable and removable side steps. JK-Z1 jeeps feature a 3 inch short arm long travel suspension lift with 35 inch tires mounted on 20 inch black satin wheels. SCA Performance utilizes the best in the industry products for their custom jeeps. The JK-Z2 from SCA Performance features a 3 inch lift, and 20 inch satin black wheels wrapped with 35 inch tires. Rock Crawling style rocker guards and carbon fiber graphics make a bold statement.